Currently viewing the tag: "Bar Wars"
Roslyn Bar Wars 2017 Was Epic! Bar Wars was another epic event this year – the biggest battle yet! Congratulations and thanks for all of the great participation, donations, and outstanding sportsmanship! 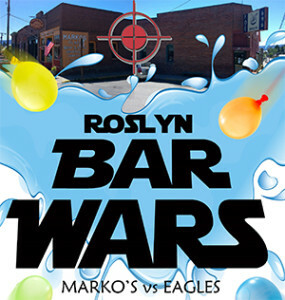 For those that don’t know, Bar Wars is an annual water balloon war between the patios of Marko’s Place and the Roslyn Eagles. This year, the trophy went to Marko’s, but the real winners are the charities this event is designed to support. The event raised nearly $3000 to split between ARRF and the Roslyn Library. As previously noted, the only word that accurately describes this year’s event is “epic!” All totalled, over 12,000 water balloons were thrown. Eagles came on strong early, barraging Marko’s with a torrent of balloons. Paired with the blaring Star Wars Soundtrack echoing out of the Eagles patio sound system, the 696 were truly laying down liquid terror from the sky. However, before long, Marko’s was able to push their way out into no-man’s land and fight from the alley (thanks largely to custom shields many participants made in advance of the battle). In addition to balloons and shields, there was also no shortage of super soakers, giant sling shots, and water buckets. Marko’s even had an archer (armed with a water balloon firing bow) laying down sniper fire from the neighboring Hideaway’s patio. Then, just as the mayhem seemed to reach its peak, insurgents joined in from the street with the full power of the Roslyn Fire Department. 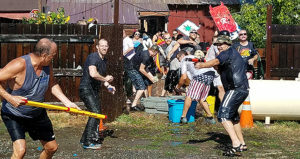 Both the Eagles and Marko’s had no choice but to endure the drenching wrath of the fire hoses – which many likened to being affronted by one of the dragons in Game of Thrones. Through it all, both sides battled fiercely until every Bar Wars T-Shirt worn by the Eagles and every superhero costume worn by many of the Marko’s fighters were soaked to the core. About 45 minutes after the battle began, referee Gus blew the horn to signal war time had once again transitioned back to peace. Thanks also to everyone who went above and beyond to raise money ahead of the event as well. Raffle prizes and fund raising efforts supported by The Roslyn Candy Company, The Roslyn Grocery, Northwest Bicycle Improvement Company, Hope Gallery, Cicely’s Gift Shop, Roslyn Rags, Fused, Whole Pet, Jeb’s Pet Supply, the Eagles, The Roslyn Roadhouse and WhyRoslyn were all essential to the success of the event! Congrats on a great Bar Wars, and see you all again in 2018! 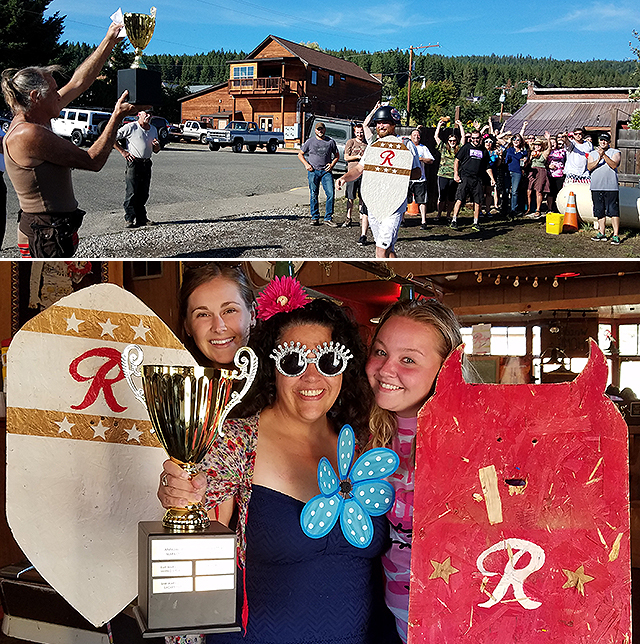 The Eagle’s Club took the trophy this year at the Second Annual Roslyn Bar Wars Water Balloon Battle. The trophy that sat proudly for a year in the window at Marko’s Place is now sitting inside the Aerie 696. 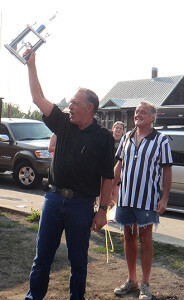 Though the Eagles took the prize this year, the real winners are ARRF and the Roslyn Library, who will be splitting the $1000 raised at this year’s event. The event was well attended at both venues and the streets were crowded with innocent observers and under-aged insurgents. This year’s battle was scored on 3 criteria: most spirit and enthusiasm (won by Eagle’s), hardest fought battle (won by Marko’s), and most money raised (won by Eagle’s). In addition to over 2000 balloons, participants on both sides battled with hoses, buckets, super soakers and squirt guns. The Eagles had a massive slingshot to launch balloons deep into Marko’s territory, but Marko’s didn’t go down easy. In one instance, the Marko’s team even pushed into Eagles territory and stole some of their ammo. Thanks to all who participated! More photos are available here! Bar Wars Promises Wet and Wild Fun! On Saturday, August 22nd, Marko’s and the Roslyn Eagles will be hosting the 2nd Annual patio vs patio Roslyn Water Balloon War. This event is sure to be an awesome way to beat the heat and have fun doing it. Doors open at noon at the Eagles (members only) and at 2pm at Marko’s. So come on down, choose your allegiance, and prepare for the water fight at 4pm. Like last year, Marko’s will be playing to raise funds for the Roslyn Library and the Eagles Club will be playing for ARRF. A donation to your side’s cause is requested to participate in the battle. Water balloons will be provided, and you are also welcome to bring your own balloons and super soakers. The Eagles will be manning the grill, offering $6.50 burgers and fries from 2pm until supplies are depleted. Food costs are being covered by the Eagles, so every dollar spent toward food will be donated! There will be fun-in-the-sun raffle prizes as well. This water balloon war is for a couple of great causes, so come on out and show your support (please note, this is an age 21 and over event)! Visit here for more information and a recap of last year’s event!